The People's Newsletter from the People's Movement in their bi-monthly newsletter carry an article on Brexit which is topical given that the British go to the polls on it this Thurs 23rd June. The various opinion polls show it to be relatively close. The article here from the People's Movement puts forward good Left wing arguments why Britain should leave and they are good reasons for Ireland to leave too. The impression given is that the Brexit referendum was agreed to because of political pressure from the people. It is likely though that there are considerable powerful interests within the elite want to leave as they see their chances to be better off in the long run, yet those arguments not discussed here would be more issues within national capitalist faction. The People’s Movement is urging Irish people in Britain and Northern Ireland to vote “leave” in the referendum on 23 June. 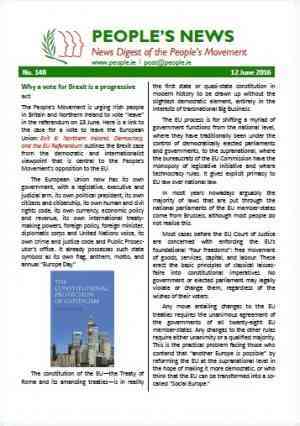 Here is a link to the case for a vote to leave the European Union: Exit 6: Northern Ireland, Democracy, and the EU Referendum outlines the Brexit case from the democratic and internationalist viewpoint that is central to the People’s Movement’s opposition to the EU. 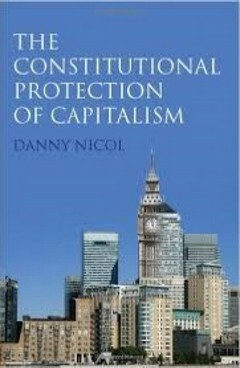 The constitution of the EU — the Treaty of Rome and its amending treaties — is in reality the first state or quasi-state constitution in modern history to be drawn up without the slightest democratic element, entirely in the interests of transnational Big Business. The EU process is for shifting a myriad of government functions from the national level, where they have traditionally been under the control of democratically elected parliaments and governments, to the supranational, where the bureaucrats of the EU Commission have the monopoly of legislative initiative and where technocracy rules. It gives explicit primacy to EU law over national law. In most years nowadays arguably the majority of laws that are put through the national parliaments of the EU member states come from Brussels, although most people do not realise this. Most cases before the EU Court of Justice are concerned with enforcing the EU’s foundational “four freedoms”: free movement of goods, services, capital, and labour. These erect the basic principles of classical laissez - faire into constitutional imperatives. No government or elected parliament may legally violate or change them, regard less of the wishes of their voters. Successive EU treaties have also laid down a deeply right - wing economic agenda. This has resulted in the interests of the banks and big corporations being put before those of the people. The most glaring examples of this have happened in the Republic and in Greece. There is widespread opposition throughout the EU and the United States to TTIP and CETA. Both trade agreements could open the way for business corporations based in the EU to take legal action against entire states whose national regulations on health, labour or environmental standards are regarded as “barriers” to trade, or affect corporate profitability, and would amount to a takeover of fundamental powers of government by representatives of corporate capital, operating, in the European context, in conjunction with the EU bureaucracy. A PDF copy of the People's Movements newsletter is available at the link below. The European Union now represents the biggest threat to workers’ rights, public services, and the right of nations, including the Irish nation, to have control over their own affairs. It is no longer an area of economic cooperation but an emerging superstate, where people’s interests and welfare are subordinated, by law, to those of the market and big business. A British withdrawal would force a re-evaluation of all existing EU treaties and would encourage the growing Europe-wide popular opposition to the denial of national democracy and independence that is at the heart of the EU. The EU is an inward-looking shrinking market, mired in recession, with a dysfunctional currency and high unemployment. The Greek and refugee crises have exposed the “solidarity” on which the EU is supposedly based. But EU rules, laid down by various treaties, mean that the EU cannot be reformed from within, because just one state, such as Germany, can veto reform. How does membership of the EU threaten the NHS? Continuing EU membership means that two transatlantic treaties, TTIP and CETA, being negotiated in secret by the EU, would allow the privatisation of the NHS. Privatisation would then be impossible to reverse. TTIP and CETA would also enable companies to sue governments where policy measures might harm profits. A British withdrawal from the EU would create a major obstacle to the adoption of TTIP and CETA. But will a British withdrawal re-establish a border between North and South? No. Both right and left in Britain recognise the importance of trade between Ireland and Britain, and no-one wants to obstruct that. Equally, the existing Common Travel Area predates either country joining the EU, and will survive British withdrawal, just as Norway, a non-EU country, has kept its common travel area with Sweden and Denmark, which are in the EU. Will we lose EU funding? Inside or outside the EU, the North’s funding has been under threat by the Tory government; but Britain itself gives more money to Europe than Europe sends back, so the money the North gets from the EU will still be available in the event of withdrawal. Regional Grants, Structural Funds, Farm Payments and “Peace Process” funding are in fact taxpayers’ money that is just recycled through Brussels. The European Convention on Human Rights and its human rights court at Strasbourg — not the EU — guarantee our human rights. Voting “Leave” will not affect existing human rights protections. Only a tenth of the of the British economy is involved in trade with the EU. A country does not have to be a member of the EU to trade with it; so trade with the EU and with the world outside it will continue in the event of a “Leave” vote. • Have confidence in your own democratic achievements and assert the right of peoples to decide their own laws and international policies as the only basis on which to build a truly progressive society in Ireland. Could we not stay in and reform the EU? The elected European Parliament is little more than a rubber stamp without the ability to initiate legislation. The majority of MEPs are at the beck and call of an army of 20,000 corporate lobbyists. The text of the above link to Facebook has been added here because Facebook is notorious for link redirecting to other places within facebook pages after awhile. Here are six good reasons why Democrats in Northern Ireland, whether Nationalist, Republican or Unionist in their capacity as UK citizens should stand with their counterparts in England, Scotland and Wales and cast their votes for leaving the EU on 23rd June. They answer the wildly inaccurate and exaggerated claims that have been made regarding a “Leave” vote. A vote for “Brexit” would be a mighty blow to the reactionary EU project. Other EU countries would also start thinking of leaving. It would also open up the possibility of the Republic re-establishing its independence especially in view of the further inevitable euro-currency crisis. Northern Ireland’s economic and social underdevelopment is due to remoteness from the markets with which it is integrated coupled with a lack of control over its own economy. This is the reality for Northern Ireland both within the UK and the EU. Northern Ireland’s economic, social and historical legacy disadvantages are supposed to be compensated for by resource allocations from London and Brussels. The transfers are on a totally different scale. Expenditure by Brussels in any one year amounts to little more than 1% of the EU annual gross domestic product, a tiny relative figure. This contrasts with expenditure on public transfers by EU member states like the UK of between one-third and one-half of their annual national products. In addition the UK is a major net contributor to the EU Budget, so that local EU projects which people think Brussels is funding are really being paid for by UK taxpayers. EU subsidies in the form of Regional Grants, Structural Funds, Farms Payments and money for local “Peace Process” activities are in fact taxpayers’ money being recycled through Brussels. While Northern Ireland may have been a net gainer to the tune of around £200 per family from the EU, this is a tiny fraction of the £20,000 per family which currently comes from London to fund public services and benefits. In addition we contribute almost as much in taxes to the EU as we get back and lately the gain has become smaller. £300m is received each year within the CAP accounting for virtually all of farm income plus about £90m for structural and PEACE funds. But taken together, this is only about 2% of NI public spending. Over the past decade the UK paid over £150 billion to the EU budget – far more than it gets back. The money does a round trip to Brussels and the EU decides what it is spent on in NI. A “Leave” vote would leave London with an extra £14bn to spend and while £4 billion of existing commitments mainly in agriculture would need to be funded this would still leave an immediate net gain of £10 billion or £600 a year for a couple with two children. Among other economic benefits voting Leave would give back control of the fishing industry. The EU and the Common Fisheries Policy (CFP) are inseparable. Under it, the territorial waters of the Member States are fished in common. The CFP has had a disastrous effect on NI’s fishing fleet. In 1985 there were 1,159 sea fishermen while the number had fallen to 654 in 2009. The EU is an inward-looking shrinking market mired in recession, with a dysfunctional currency and high unemployment. NI’s trade is largely accounted for by cross border trade with the Republic but also in trade with non-EU countries – some 43%. Free trade will continue between Ireland and the UK under all realistic “Leave” scenarios, so there will be no customs posts on the North-South border within Ireland, no passport controls or anything like that. Such claims are simply scaremongering. Free trade does not require the supremacy of EU law. Only 10% of the UK economy is involved in exports to the EU. The other 90% are involved in UK domestic business and in exporting outside the EU. The EU is far more dependent on the UK economy than the UK is on it. If the Remain side wins, the job-destroying Transatlantic Trade and Investment Partnership (TTIP) is inevitable. Bilateral and multilateral trade and investment treaties, which EU Member States previously negotiated with countries around the world, are now an “exclusive EU competence” and are negotiated on behalf of Member States by the Brussels Commission. Commercial treaties such as TTIP and the Comprehensive Economic and Trade Agreement (CETA) open the way for EU-based business corporations to take legal action against entire States abroad whose domestic regulations on health, labour or environmental standards are regarded as “barriers” to trade or affect corporate profitability. Collective trade pacts negotiated by the EU expand the role and powers of such private corporations through their ability to access sympathetic international arbitration tribunals. Under previous World Trade Organisation (WT0) rules only governments had the standing to take actions of this kind. That is no longer the case. Transnational companies have already used such lawsuits across the globe to reduce competition or threats to their profits. Even the threat of such litigation can cause governments to shelve socially progressive policies. TTIP proposes a scheme of “permanent regulatory cooperation” between the EU and USA. The imposition of laws and regulations is the most fundamental function of government. In democratic States regulation on social or economic grounds should be the result of open discussion and decision by the elected representatives of the People. What transnational business interests want is minimum regulation and “equivalence” between EU and US standards at the lowest possible level. This proposal would institute a permanent behind-the-scenes negotiation between EU bureaucrats, American ones and corporate lobby-groups on both sides of the Atlantic long after the TTIP treaty has been signed and ratified, when public interest has waned. It would amount to a takeover of fundamental powers of government by the representatives of corporate capital, interacting with the EU bureaucracy. This is a result of trade agreements having become an “exclusive EU competence”. The EU gains power by these means to influence domestic economic policy in non-EU countries, particularly poor and less developed ones, which goes far beyond enforcing free trade and restraining traditional trade protectionism. A vote “Leave” would create a major obstacle to the adoption of TTIP but if the “Remain” side wins the referendum TTIP is inevitable and if agreed by Brussels and Washington, would be practically irreversible. The long-established Anglo-Irish common travel area, which goes back to 1923, is a matter exclusively for the British and Irish Governments and is not an EU matter. Irish people will continue to move freely between the two islands and across the North-South border inside Ireland as they have always done. Also in the event of “Brexit” and a subsequent EU/UK trade agreement, with the Irish State remaining in the EU at least for a period while the UK left, it would be in the interest of both the UK and Ireland to enforce one another's migration controls and customs controls if those were needed, with minimal interference with cross border movement as is the case between Norway and its Scandinavian neighbours in the EU BUT in the event of a “Remain” vote, David Cameron’s EU agreement will be implemented, which means that new immigrants to the UK will have lower social benefits than those already here. It will be impossible under EU law to differentiate between Irish immigrants on the one hand and non-Irish ones on the other. So new Irish immigrants to the UK must face cuts in social benefits too. 4. What interests does the EU serve? Remaining in the EU means obeying EU laws made in Brussels by unelected bureaucrats without having the ability to change a single one of them. Having to obey laws made by others means being ruled by others. It is the opposite of being independent, sovereign and democratic. These laws and regulations serve the interest of EU-based Transnational Banks and Big Business, not the ordinary people of Britain or Ireland while all the time Brussels can impose heavy fines on any State that disobeys them. Membership of the European Convention on Human Rights, which 55 European countries subscribe to, underpins various personal freedoms but has nothing to do with the European Union. The European Court of Human Rights is a separate body entirely from the EU’s Court of Justice, so that voting Leave will not affect the human rights protections of people in the UK or Ireland. Claims that a Leave vote would endanger the Northern Ireland peace process are also wholly unfounded. This is part of “Project Fear”. Remember 1999 and the threats of job losses and economic ruin if Britain did not abolish the pound sterling and adopt the euro? Or 2011 when Germany’s Chancellor Merkel claimed that peace in Europe was under threat if the Banks were not bailed out to protect the euro-currency? The restoration of the power to democratically elected Parliaments and Governments to make their own laws, negotiate their own trade agreements and impose social controls on capital in the interests of the common good. Here is George Monbiot's take on the referendum. It seems hard to know which is out of the frying pan and which is into the fire!! So amazingly Britain voted to leave by 52% to 48% and even more surprising all the main political parties were united in that Britain should stay. This result therefore says something very important in how the majority of people in Britain feel the system has not served them well. The result raises a number of questions, the first is will Britain actually leave? Will they do an Irish on it and get them to vote twice? And will the political forces, clearly in shock wage a campaign to block it on legal grounds and other methods. At an EU level, the Danes are not happy with the EU and it is thought up to 45% want to leave. Netherlands is in a similar position and efforts may be made there to have a referendum on leaving. The Greeks surely must realize that despite the victory of Syriza government they have been betrayed and the EU has got its boot firmly on their heads with no prospect of removing it soon. Paul Murphy got it right today on the RTE Radio 1 (on the special program after 9am) when he said the key is the type of negotation Britain will go for to leave and that rather than leaving with a right-wing strategy, that it is essential that Jeremy Corbyn leads a Left wing exit and moves away from the undemocratic and neoliberal policies of the EU and to a relationship with Europe which is people centric and promotes human values rather than the right wing agenda. This result will surely have some influence on what happens next with the undemocratic, sovereignty losing, neoliberal EU-US TTIP deal and hopefully can help halt it in its tracks. There are of course wider and longer term issues here. The referendum itself has been presented as a sop (that went wrong) to the people of Britain but it would never have got this far without some support from some factions inside the elite. Such a faction would be the one that sees the global dominance of the US dollar is nearing the end and therefore their global dominance despite current efforts by the US to destroy, stomp on, dictate and heavily influence every country. These people see that membership of the EU might hamstring their efforts to deal with a combined powerhouse of China and Russia and by forging ahead get a better deal for Britain than they might otherwise get as a block within the EU. It ought to be recognized that the states of the EU at the moment are simply vassels of the USA, and the polices of the EU amount to political and economic suicide from agreeing to the sanctions against Russia which has cost the EU dearly and totally against their own self interest, to the simmering chaos in the Ukraine that threatens to spill over, to the flood of immigrants from countries bombed by the US and Syria where the US and it allies through the proxy of Saudi Arabia and Turkey have supported and unleashed the ISIS monster that has driven millions of desperate people towards EU and has caused huge internal political tension. The EU-US TTIP agreement itself is also determetrial to Europe at the level of the ordinary citizen and the agreement itself has been pushed all the way by the US. The TTIP agreement combined with the TTP for the Pacific region but excludes China, is the economic tool which the US intends to excercise control globally and retain its hegemony. To put the backdrop of US dominance is perspective, the might of the US rests on the might of the dollar which was once a gold backed currency. It also rested on the huge industrial base, it's large market and after World War II, the took up the reign of the global dominant power from Britain. Since then things have changed, the industrial base has largely moved to China, the resources are much more depleted and the dollar is now a fiat currency as are most of the other ones, but the difference is that for the past decade or so, China and Russia have been steadily stock piling gold and when the time is right they will make their move. Up to recently all international trade including the buying of oil on world markets had to be done in dollars. For the Russians' this was very costly as they had to buy dollars. Since last year China and Russia agreed to drop the dollar in oil trade and other areas. The role of the Chinese yuan is increasing and can only increase further and they have the biggest pot of gold to back it. All the others have is their credibility and that is a waning currency in terms of the past 15 years of US influence in the world. Therefore for those in Britain who have been watching these longer term trends and evolution of world events may in time be seen to have a clearer picture and their position might look as bad as it seems today at least from a trade and economic perspective. The political and democratic future is still very much uncertain either way. There is a lot of nonesense spouted in the media about what this means by mainstream pundits and what they all do in common is to ignore the undemocratic right wing nature of the EU and the bigger world events that have been unfolding. Instead they have to resort to the latest tweak in the markets and whip up hysteria with scare stories and threats. Alas there will be a 2nd vote . . . . Anybody who thinks that the powers-that-be will merely follow through on the message from the electorate in the British State and do the Brexit is wrong. They are ignorant of the fact that democracy runs contrary to the exercise of executive power in ol' Blithey. The Establishment in England will rule in their social and economic interests, whilst paying lip service to popular mandates yadda, yadda. What we're gonna see is not BrExit but a political fudge. Over the next 12 months the Westminister govt will negotiate the finer points of a obstensively altered relationship with the EU. But in reality nothing will substantially change. The new arrangements will be the continuation of the British State's relationship with the EU minus the Single Market i.e. the free movement of people across the borders of EU member-states. It's a sad fact but many of those who voted for Brexit in Britain's referendum did so to "keep those bloody foreigners out". The political elites and their cheerleaders in the Establishment press know that this issue has to be resolved - beware the risen people (even if it right-wing populism, ESPECIALLY if its right-wing populism). The British govt will continue to be involved in some decisions at the heart of the EU - both officially and thru quiet channels. The newly negotiated arrangements between London and Brussels & Berlin will be put to a vote with the public saturated in a climate of consent. That manufacture of consent is being planned right now, and will like nothing seen before. Even heavy hitters on the Leave side last time will row in, endorsing the "new relationship"; the likes of that buffoon Boris. The predominance of Brexit in discourse for the last 6 months, right now, and into the short term future presents a opportunity for those seeking to politicise the masses in the pursuit of radical transformative change. There is more likelihood now of discussions about politics, as the powers-that-be run around with their hair on fire. That opportunity should be recognised and used. We shall see M. Monnet. We shall see. A large section of the Tory party is eurosceptic. Many educated English people dislike the suavity of French culture and are envious of German technological and economic accomplishment. Retrospective: "It seemed like a good idea at the time" (It really wasnt. And this argument fundamentally ignored that consequences to working people, immigrants, and young people that brexit has wrought, so here we are".